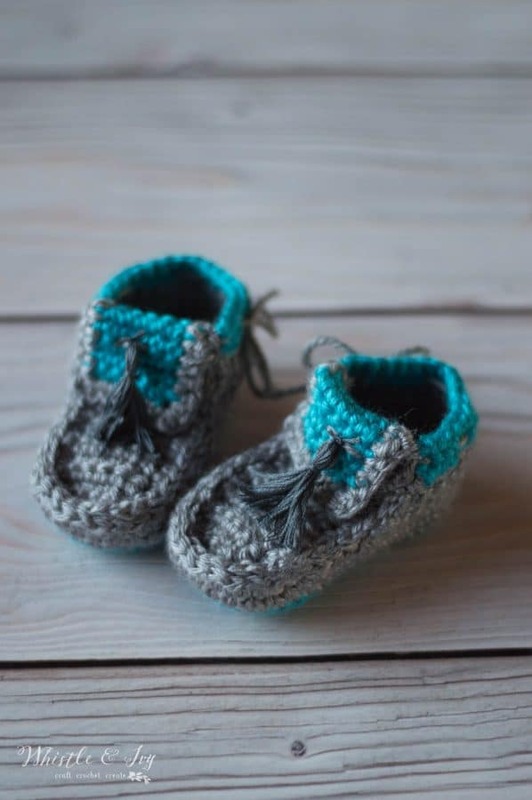 This classic baby booties crochet pattern will become your favorite go-to crochet Mary Janes for baby! Worked in the round, this pattern works up fast and the pop of color makes them a fun project to make. They are perfect for your next baby shower! This post includes affiliate links, which means I get a small commission if you make a purchase. For more information, click HERE.Thanks for supporting Whistle and Ivy! I think I am a fan of classics. These crochet mary janes are definitely classic. When I set out to design these, I knew I wanted something cute and quick. These crochet baby booties fit the bill. 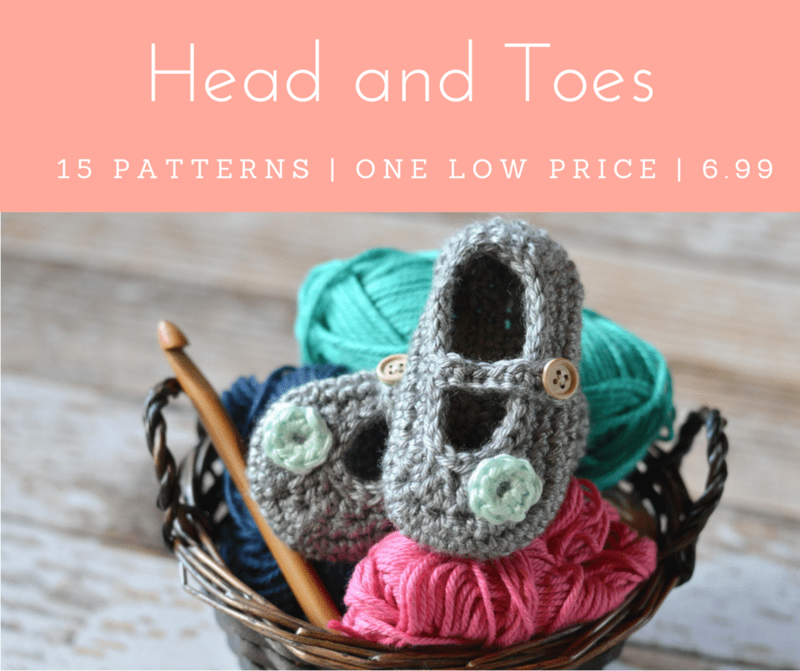 Not only will you love everyone’s “oohs ” and “ahhhs” over how cute they are, you will love that you can crochet a pair in under an hour. Plus, the little dot gives just the right amount of contrast to make these little shoes extra adorable. You can either make the button functional or decorative, it’s your choice! Either way, be sure to seal the threads with super glue or clear nail polish so there is no risk of the button coming off. And, due to a Youtube commenter, I also made these crochet baby booties with a little more color pop! Read directions on how to make the bottom sole a different color. 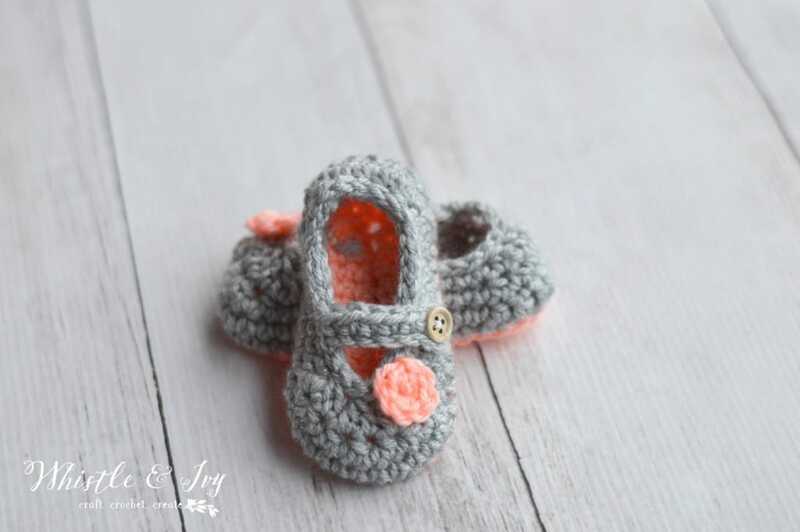 Please remember: You are free to use this little mary janes free crochet pattern to make and sell your own crochet baby booties, but do not republish or distribute this pattern in any way. DO NOT use my photos in your listings. Please do share my blog links! It’s a quick and FREE way of supporting Whistle and Ivy and more free crochet patterns in the future. The written pattern below is for size 3-6 months. You can find a PDF that includes 5 sizes, Newborn through 9-12 months, in my Ravelry or Etsy shops. 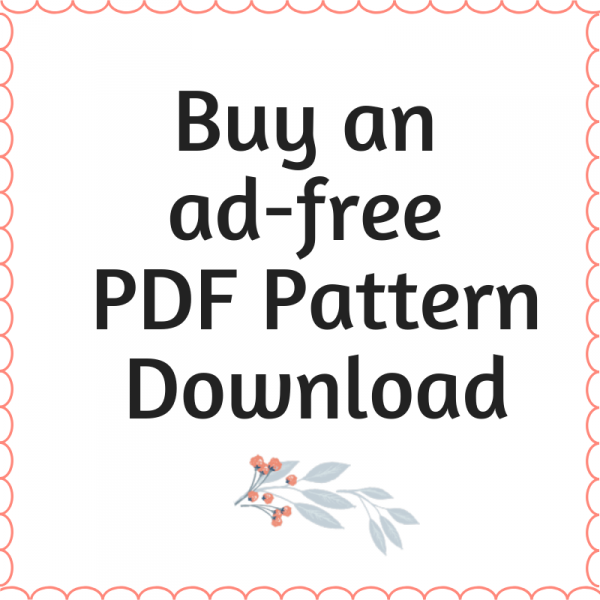 The PDF is formatted for easy crocheting on-the-go or for easy printing, it doesn’t include ads or comments. Thanks for your support! 1. Work 3 sc in 2nd ch from hook, sc in next 4 chs, hdc in next ch, dc in next 3 chs, 7 dc in last ch. Dc in next 3 chs, hdc in next ch, sc in next 4 chs. Left shoe: Sl st 23. Ch 9. Sc into 5th ch from hook. Sc 4. Sl st into next st on the shoe. Sl st 3. [27 sts (not including the sc and ch sts of the strap)] Tie off. Weave in ends. To make the shoes two-toned, work steps 1 -3, but end round 3 by moving up your stitch marker, sl st into next st and tie off. 4. Join Color B at the stitch marker. Work through BLO. Ch 1. Sc in same st. Sc in next 41 sts. (42 sts) Join with a sl st.
5. Ch 1. Sc in same st. Hdc in next st. Dc in next 7 sts. Hdc in next st. Sc in next 32 sts. (42 sts) Join with a sl st.
6. Ch 1. Sc in same st. Sc2tog. Sc in next 5 sts. Sc2tog. Sc in next 10 sts. Sc2tog 7 times. Sc in next 8 sts. (33 sts) Join with a sl st.
7. Ch 1. Sc in same st. Hdc2tog. Hdc in next 3 sts. Hdc2tog. Sc in next 9 sts. Dc2tog 4 times. Sc in next 8 sts. (27 sts) Join with a sl st. Right Shoe: Sl st in next 12 sts. Ch 9. Sc into 5thch from hook. Sc 4. sl st into next st on the shoe. Sl st in next 14 sts. [27 sts (not including the sc and ch sts of the strap)] Tie off. Sl st in next 23 sts. Ch 9. Sc into 5thch from hook. Sc 4. Sl st into next st on the shoe. Sl st in next 3 sts. [27 sts (not including the sc and ch sts of the strap)] Tie off. Dot: Start with adjustable ring or 3-ch loop. Work 8 sc into the ring. Pull your ring tight. Join with a sl st and tie off. Attach a small button on the opposite side of your strap with a needle and thread. Make sure it is VERY secure, and seal the button’s threads with a dot of super glue or finger nail polish over where they cross on the button. Attach the dot by hand sewing, or attaching with hot glue. If you are using hot glue, but sure your are gluing to the very edge of the dot, as the edges of the small circle may curl up over time. For a video tutorial of the 3-6 month size, click HERE. Aren’t they so fun? 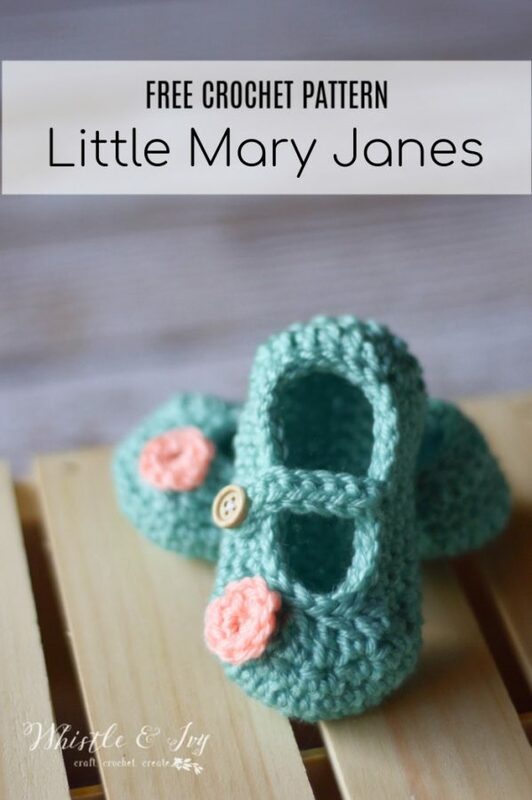 I hope you enjoyed making these cute crochet mary janes! At the end of rows 1 through 7 I know alot of people join end rounds with a slip stitch do you not join the end of rounds 1 through 7 with a slip stitch I didn’t see anything in the pattern about it so just wanted to make sure??? These little shoes are worked in a spiral, which is another common technique. Hello! What a beautiful pattern! I was wondering about Row 7. On the video you say that Row 7 is hdc followed by dc. In the written pattern for 0-3 months Row 7 is worked sc and then dc. I didn’t know if it is different because of a smaller size or maybe a typo. Should I follow the written tutorial of sc followed by dc or the video tutorial of hdc followed by dc? Thank you! Hello! I have updated the written pattern to my liking but haven’t updated the video yet. The video will work out and the written pattern will work out, but you need to pick one of them to follow. Perfectly written, beautiful pattern. I made two pair. 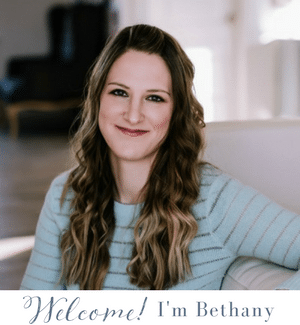 Thank you, Bethany. Found this pattern on Pinterest and made the 0-3 month size for my niece. Turned out perfectly! I made sure to mark my stitch rounds and the video was awesome for the few questions I had. Thanks for the great pattern! So glad you liked it! Thanks for your kind words! Thanks for the pattern, it’s adorable! I just wanted to make sure about the number of chains for the strap? You write ch.9 in the 3-6 months pattern but you chain 12 in the video…I chained 12 but was just wondering? Also, 12 is more than the ch count for the bigger sizes…should it be 12 in all of them? Hi Jessica! I have edited the written pattern over the years (this is one my first patterns) but have never went back and made a new video. I perfer the smaller chain, but it’s not a huge difference either way. I made this pattern with a different embellishment. I gave them as a gift at a baby shower. I wanted to show you a picture but not sure how to post it. Thank you so much for this darling pattern. I will be making them for our new great granddaughter. Hi! I tried making the 3-6m shoe, and my rounds kept ending up on the side of the shoe forcing the decrease stitches to be off-center and the strap too close to the front of the shoe. I kept careful track of my stitch count making sure it lined up with yours at the end of each round. I backtracked and could not find any errors, at least with stitch count or stitch sequence… The only thing I can think of that might be wrong is in the second round… Do you start your first stitch of the second round in the first sc of the first round or in the ch1 behind it? I skipped the chain, since you didn’t count as a stitch, but that is when I noticed things being slightly off-center, which of course became more extreme by the time the shoe was finished. The end is on the side, that is correct. This is because the round ends before you begin the increases around the heel, because you begin the show with the increase (working 3 sc in 2nd ch). Everything should be perfectly centered, because I designed it that way. You must be getting off somewhere else. You begin the second round is the first sc, but there should not be a chain, as this shoe is worked in the round without any joins. Did you watch the video? I do, in fact, work in the first sc in row 2, otherwise you would end early. You begin with 3 sc in the 2nd ch, and you begin row 2 working 2 sc in each of those three. But if you have figured out an alternate method that works for you, then do that! Adorable shoes! Had no problems whatsoever. Did thr smallest and used a smaller hook to get tje size I needed! I used a different fastener amd will nr adding the dot as well. And yes, took no time at all! ❤❤❤ Thank you…I love Mary Janes! Thank you so much! I am so glad you loved them! These Mary Jane’s are adorable. Going to give them a try. What does *Sc 2 sc in next st* work 3 times mean? It is an increase. Increase 3 times around the toe. So is it sc/2sc in next stitch and then in next 3 stitches? I’m confused as you can see! 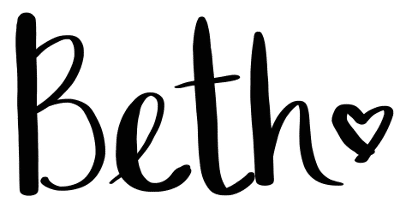 You single crochet in the next stitch, then two single crochets in the one after that, and repeat that three times– for a total of 9 single crochets worked into six stitches. Using a row marker (I took out an earring and stuck it in as I was working!) really helps– you should end up with the right stitch count (as noted in the pattern) as you reach that marker every time! :) Hope that helps. Thanks for the clarification. I was having a problem with this part also which was leaving me short about 9 stitches. I will try again and am sure that I got it now. Hi again. I am doing the 3-6 month Mary Jane and am ending each round in the middle not at the heel. Not sure what I’m doing wrong. Lovely little shoes <3 I modified them a little with a contrasting colour on the edge of the sole and some little holes at front for a friend. Thank you for the pattern! Your patterns are adorable! I really enjoy how it’s your style! I am new in reading patterns.What does the * mean in step 3? Thanks. It holds a piece of the instructions together, so you will work the entire contents the indicated number of times. I love this slipper and would like to make it for my 18 month old granddaughter as house slippers. Can you tell me how to increase to that size? This is a great pattern and looks exactly like the picture! For the 3 month size, step 3 has an incorrect count. The stitches only equal 30 stitches, not 38…. The pattern needs a few tweeks and more testing. You are not counting the increases. Step 2 has 30 sts, step 3 increases by 8 (3 around the heel, 5 around the toe), bringing the count to 38. This is for Jessie. After several tries I realized I was skipping the sc on the repeats. I did the same, three times, before I saw the sc just before the sc2! Finally got the pattern correct, thank you. I think that possibly the US instructions may be set out differently to Aus, and of course, we need to remember to crochet the correct stitch. Now I need to find a pretty flower pattern for the decoration. Well, I believe the size 0-3 would be a size 1, no? I did this pattern in 2 different sizes and its nowhere like it is in the picture. I did the 3-6 & 9-12 and both the counts were wrong on the pattern. Cute shoe but the pattern needs to be corrected and actually tested in each size. Wasted yarn. I assure you, these patterns have been throughly tested. Would you like help? I offer help for anyone needing it with my patterns. I also have a video (link in the post) if you are interested in watching. Where can I find the 9-12 mo pattern? These are great! You weren’t kidding when you said they work up in an hour. I just did one shoe in a beautiful green and it came out adorable! Do you have a pattern for the little dot flower as well? Thanks, so glad you like them! Yes the dot is before the construction on the second page. Wonderful thank you! I guess I didn’t pay attention to the second page! I’ve made the 3-6 month size and just made the 6-9 month size. I felt the button hole was a little too small and hard to get around a button, so I single crochet into the 6th stitch from the hook and it is working much easier. Just thought I’d send that little tip along. By the way…..these are SO adorable! Is the button a “working” button, or decorative? The hole left in the strap is soooo tiny! It is a working button. Did you work into the 5th ch from the hook? This actually makes the buttonhole a good size, so I am guessing you may have misread that part? Let me know. I did work into the 5th chain, but I crochet rather tight. I’m using a G hook rather than an F for that reason. I will just work the chains a little looser. They should be right side-out as you make them, be sure you are working them from the outside. Not sure if it’s because im left handed, but it woked out I just had to crochet in the backloop onthe sc round with the hdc. Its the right way and still the right shape. Well sometimes when you are working something curved, it can accidentally curve up the wrong way. It’s something I did when I first started. You just have to be aware of it, and make sure you are working so the right sides of your stitch are facing out. Really, it’s no harm done, you just have to turn it right-side-out when you are done. I am glad you got it! Please let me know if you have more questions. Thanks for the patterns! Very well written! Yeah, I followed the directions for the right shoe but it made a left shoe inside out so now I will have to make the right one inside out too because I already accessorized. I added elastic under the strap and a non skid sole made from shelf liner. Hi Bethany I crochet these slippers for my granddaughter at Christmas and they were so cute. The only thing is that they are very slippery on hardwood floors and she fell and really bumped her head. Is there anything that i could put on the bottom to make they non skid? I’m haven’t personally tried it myself, but I have heard some readers use spray-on silicone. I use hot glue. Put a couple of lines on the bottom and let dry. Worked for my niece when she started walking. Hi. Adorable pattern. Please tell me where I start on 3-6 month size after round 3. I see the other sizes don’t tie off. Thanks. Sorry! I see there is a typo there. Don’t tie off, continue around. Ok, completely ignore my last comment. I mudt be blind,lol! I JUST saw where to get it…. I , do want to thsnk you for your absolutely gorgeous patterns. As a mother of 5 on a tight budget, i appreciate the kind generous designers like you who make it possible for mothers like me to make beautiful things for our loved ones. Thank you so much! Hi! Thanks for your great patterns. I am a beginner and your videos helped me get started, now I’ve done 3 of your shoe patterns and learned all the stitches. Thanks! The pattern actually calls for worsted. Unfortunately, I only use Caron so I can’t comment on what other yarns will do. You will just have to work up a shoe and compare it to the approx length in the pattern. Hi! I love your creations they are the cutest ever!! Thanks for the pattern written and the video tutorial it is very helpful, however I have found discrepancies from pattern to video on a couple of your patterns. The video works best because I use the pattern and my stitches are off…I always have to adjust. I want to save your pattern to keep making is it okay if I repost your pattern directing back stating I adjusted slightly? Cute shoes! On step four for the 0-3 month is it sc all around or hdc all around? The video says you misspoke. I am confused. I always type the correct thing (it is so nerve-wracking to shoot a video, and my face isn’t even in it!) so trust the text, not my voice. Sc all around except work a hdc in the last st.
Oh no! Sorry, it should say single crochet. I am uploading an updated one shortly. In fact, I actually work 8 sc in the magic ring and tie off there. Sorry for the confusion! Thanks, worked up just perfect. Will be trying more of your patterns, crochet and sewing. Thanks for sharing. Will give credit for your patterns, too. Thanks! Glad you got it worked out. What is the best way to attach the flower? Honestly, I just use a dab of hot glue. Did you try tapping “reader view” or opening in Adobe Reader? The logo is a light gray watermark. I am a beginner and I am learning how to read patterns. I would love to try your patterns, but like someone else on here said, it is very difficult to read them with your black logo covering them. I am using a regular desk top, and I have tried opening it with adobe. it will not allow me to do so. the only file it is allowing me to open the patterns with is a PDF file. any suggestions? The logo is light gray, not black, so for some reason your desktop is not displaying it correctly. Many other commenters were using a Kindle, which is e-paper and having problems displaying gray, but I have no idea why you would be having problems with your computer. Did you try a different browser? PDF is an Adobe Reader file, so it should open with it. Do you have it installed? I am diabetic and I have very little feeling in my feet. Therefore I cannot feel if a shoe is on or off until I fall over it. These Mary Jane slippers are just what I have been looking for to have for myself as a slipper. If you have this pattern in adult sizes it would be very much appreciated. I am so sorry! I don’t currently have this one in adult sizes, but I have gotten requests for more adult slippers so I am going to design more. Would love to crochet your patterns but your logo covers most of the pattern and it is black so you can’t see all the pattern. You can try a different app like Adobe Reader. It doesn’t display well on a Kindle, because it’s e-paper instead of a tablet screen. The watermark is light grey and will display correctly on a screen. These are so adorable and your video tutorial was so helpful to me as a beginner. Thank you so much! I’m sure she’ll enjoy wearing them. You are very welcome! Thank you for your sweet comment, I am glad you like the pattern! Look forward to doing more of your creations. Any hints how many stitches to add? I usually go up 2 chains for each size up, but i think It would be easier to grab some bulkier year and a bigger hook and work the size 8. Adorable! Is there an optional off for this pattern? I can only read a small portion of it due to the logo covering a large area where the pattern text is. Any help would be appreciated. Thank you! If you are using a reader, try using a different reading app. The logo is very light gray when displayed correctly. Hi Bethany, this is a very smart & the best pattern that I found. 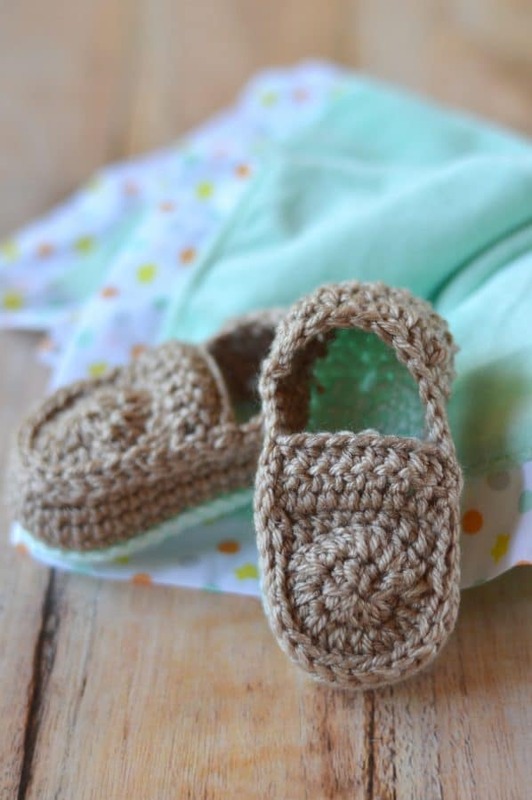 This pattern to crochet the shoes in round makes it neat and nice avoiding the confusion of whether the stepping stitch should be counted or crocheted into. Because some did and some didn’t and was not mentioned in the pattern. So I have to redo the work several times. I’m glad that I found your pattern that I can make it straight to the end. No more confusions! Thanks Bethany! You are very welcome! I am glad you like my pattern, and I appreciate your sweet comment. Thank you! Is there a way to make the Mary Jane Slipper any bigger for a 3 or 4 year old? I am not sure what shoe size your child wears, but I have this pattern in a toddler size, that goes up to size 8. But if you make it with a larger hook and bulkier yarn, you can make them even bigger. Hello there Bethany! I worked up a pair of these and I absolutely love them! Just had a few questions – 1) What size buttons did you use? ; 2) What are the average sizes for the different age groups – so I make sure I’m gifting the correct sizes. Please and thank you! Lov all your patterns. So easy for a beginner to understand. Hey! I love the video tutorial for this pattern! I am having a problem when downloading any of your patterns, where they are water marked with the logo and I can’t read through it. I was just wondering if I missed a step or did something wrong when downloading. Thank you for the help! If you are reading on a device, you need to use a different reading app than the default one. If you are using a computer, try a different browser. The watermark is light gray and doesn’t interfere when displayed correctly. I’m having the same problem as another commenter with the 6-9 month pattern, extra stitch in row 5, and then nothing fits after. If I drop a sc at the end of 5, it still doesn’t work. I’m having the same problem with the 9-12 month pattern. The 0-3 & 3-6 month ones work fine, but I’m just not good enough myself to figure out the proper counts, and it’s driving me nuts! I look forward to hearing if you’re able to figure it out. Love your stuff! I was having the same trouble on that size, here’s what I did: At the end of row 4, sc all around – do not hdc the last stitch. Then, on row 5: hdc 1, dc 8, hdc 1, sc 36. Then on row 7: dc2tog, dc 4, dc2tog, sc 10 (not dc 11), dc2tog 5 times, sc 9. Found a miscount with the last number of sc sts on step 5. Fixed it! Sorry for your confusion. I loved this pattern and two others made a pair for my daughter and my cousin. But I was wondering if you could create a high top converse bootie pattern. Well, I know there are several free ones on Ravelry. I haven’t tried them, but if they aren’t great, I can see what I can do! I found a pattern that I liked. But the person who created it had never rewritten a pattern before and the way she wrote it was confusing. Ok so I’m having a problem with this pattern. I’m making the 6-9 month size. I use a stitch marker every time. But rows 5 & 7 don’t lineup. They are a stitch or two extra on the rows. Did you follow along with the video? Yes I did. And followed the pattern exact. Idk what happened but they came out looking fine. Well the video is for 3-6 months. Did you follow along with the written pattern for your 6-9 month size? Yes I did. Went back and counted every stitch after every row. Hm. I will see if there is a mistake. Which row did you get off on? Are you using a stitch marker? Oh typo! That should say dc2tog 4 times. The Toddler Little Dot Mary Jane. I have tried to crochet this pattern several times. Who every wrote this have never written a pattern before. It can’t be done. Would you mind directing me to your crochet blog? I would love to read some of your patterns so I could get some tips on how to make mine better. Thanks! I would love to have the pattern for the hat as well. I am trying booties and a baby hat for the first time. Thanks so much! Thanks! You can sell, but you must give credit to me as the author of the pattern (my name and blog name), as well as a link back to the original pattern post. Hi. I found your pattern which was listed on allfreecrochet.com and thought it was absolutely adorable (and even doable for a newbie like me haha). And then I saw what you wrote about your friend’s little girl. I read their blog, and it really is heart wrenching… I made sure to say a prayer for them and brylee. Even with such a terrible diagnosis, their outlook and trying to make the most of the time they are blessed to have with her is unbelievably inspiring. God really has his hands over her! I hope they are all still doing well! God bless you and Brylee and her family! Thank you for your prayers! I truly believe that they are helping; this little girl is a fighter and has moved into the 5% who make it longer than 1 year. Although she is terminal, she is holding strong, and we are so grateful for the time she has been able to have with her family. Thank you! You are welcome! I love how yours turned out, the flower is so cute! 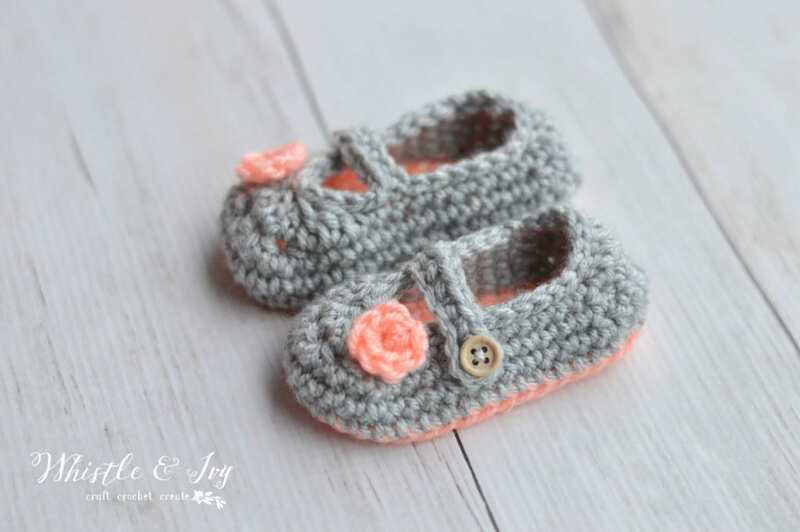 Merci beaucoup pour ces magnifiques petites chaussures crochetées pour ma petite-fille. Vos vidéos sont très bien fait. Thank you! Thanks so much for this beautifuls baby boots, it’s so cute for my granddaughter. I like your work, your videos are perfect. Thank you! I hope that you understand my English comment. Bye…bye…Have a good day! Thank you! I took 2 years of French in high school, so I understood your French a little (Just a little, haha) Thank you for your sweet comment, I am so glad you like this pattern! I am new to crocheting and your site. How is your friend’s little girl now? I noticed the original posting was nearly a year ago. So many families are being affected by cancer, just breaks my heart. Thanks for what you are doing. Hi again. I just finished your video tutorial. Wonderful job, btw. Would you please email me instructions for flowers you put on them. Thanks so much. Hi. My prayers for you all! The download for PDF is not working. At least for me. Would you please email that and one for matching hat to annaehutcheson@gmail.com. thank you so much and God Bless! Bethany, Thank you very much for the pattern. There is one picture above with a matching hat in it. Is there any way to get that pattern too? I really want to make the matching set today if at all possible. lauraelandon@gmail (dotcom) if you can email me directly. Thank you!! Beautiful! May I sell baby booties I make from these patterns? I’m looking to raise money for a pro-life agency, SavetheStorks.com. Thank you! Of course! I just ask you give me credit for the pattern. Forgot to mention Im trying to crochet 0-3 size. I just published a video tutorial, maybe it will be helpful to you! Click the video link under the pdf link on this page. Adorable booties. But help! Stuck at 5, the 8 dc makes heel part too far to left side (facing bootie at the front). Using stitch marke so dont know what I did wrong. 2 comments in one day :/ Just wanted to come back and take back the above comment. I tried again and it turned out perfect. I don’t know what I did the first two times but it was definitely user error. Thanks again for sharing this adorable pattern. So glad you figured it out! Happy crocheting! Love the booties. I am having the same problem as Geneva for the 0-3 mo size. I’ve made them two times and the strap starts too close to the heel. Things seem to be 4 stitches off for me too. I’ll keep working on it though to figure out what I am not doing right. Help! I’m having trouble with size 9-12..I’m ending up missing two stitches. Thank you so much for sharing your wonderful creations! You are so welcome! I know it’s not working :( The woman who was in charge of the fundraising unexpectedly quit, and they have not set up a new paypal donation account. Thank you so much, anyway!! The donate button (right under the second photo) will take you to a paypal donation account, thanks so much! Bethany, can you add a PayPal account where we can have a donation sent? I prefer using PayPal for online purchases. Can send to an email. If you open an account for him, then register the account with PayPal with email on that account, then people can donate from there. Great idea. Thanks for sharing your lovely design with us! Does every round end where the previous round started? Yes. Make sure that you are using a stitch marker! Thanks for the pattern-what a nice way to help your friend! I went to her blog and donated. My prayers are with them. You are welcome! Thank you so much for your prayers and donation. I would love to feature these on The Firefly Hook for our Free Pattern Friday. Hopefully it will send traffic your way and help raise awareness (and donations) for Brylee. Let me know if that’s okay and if I can use a photo of the shoes from this post. downloaded and donated. thanks so much! Lots of prayers to your friends little girl. I have 8 children of my own, 3 step-children – 22, 20 & 17, then 4 girls that my husband & I have together – 12, 10, 7 & 2 today, then we adopted a lil girl when she was 6 & is now 18 with my first grand-daughter. My point is I could not imagine what your friends are going thru & they are lucky to have the support of friends like yourself! I will pray for them & hope & wish for nothing but a positive outcome! 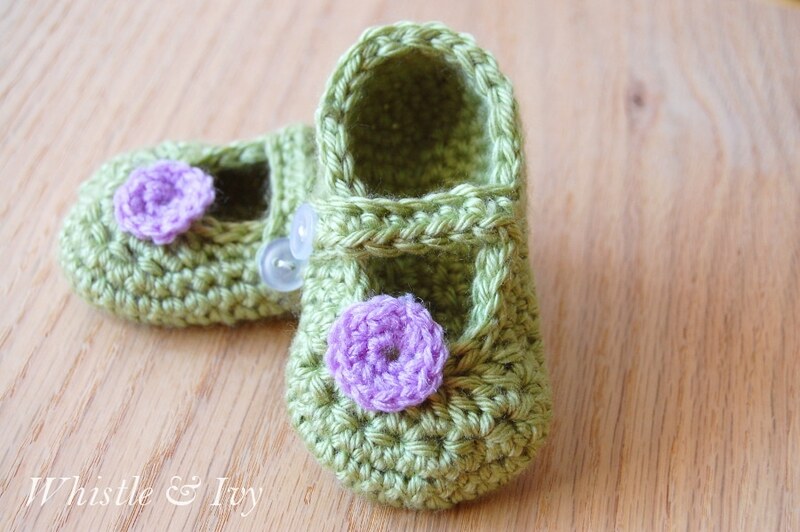 The shoes are darling & I can’t wait to make them for my grand-daughter, she is 5 mos now! Please, enter me in the contest! These shoes are the sweeties thing i have seen. I did not see a place to enter the contest, except maybe leaving a comment. I got an email stating you could win $25 gift card to Joann and girls booties,hat or boys booties, hat or woman slippers. So i chose the baby girls things.My cousin is having a little girl and i know she will just go crazy over the booties and hat. Thank you so much and God bless you! I will be praying for Brylee and her family! I tried using a stitch marker and it turned out right this time! I’m so happy :) thank you so much for the advice and the pattern, and for creating it for a wonderful cause! Yay! I’m so glad! I am going to try and put out at least one new pattern a month, so stop by again some time! Hm. I will work up a pair and try to figure out where the mistake is at. Sorry! Well, mine are working up correctly. Make sure you are using a stitch marker. The stitch marker is always on the right side of the heel, right before the heel starts rounding. If it is in the correct place, step 4 should end near the heal, and the dc 8 should start as the heel starts rounding. I’m too having trouble with the 6-9 month size and the part where you dc 8 which is supposed to be on the heal does end up on the side. I’m not sure where the problem is there, I think it may be more than the correction you had already made. This is a great pattern! I did make the 3-6 month size for my daughter and they turned out SO cute! I used cotton yarn and added a little pearl in the middle of the dot. my email is amanda.b.vanhoose@gmail.com…. thanks for your help! These booties are awesome. My daughter just turned 4 month and I want to crochet these! I have a problem with row 8 though. Can you please explain what I have to do when you say “Sc down your ch and sl st into next st on shoe”. I am very new to crochet. Glad you like this pattern! Let me know if you have any other questions! Hi! These are ADORABLE! Thanks for posting! I’ve made the 0-3 and 3-6 sizes and they turned out perfectly, but I’m having trouble with the 6-9. They don’t seem to be working out quite right and I’m too new to this to be able to explain why. There seem to be too many somethings somewhere and when I get to step 5, my 8 dcs end up on the side of the bootie. Does that make any sense at all? I’m about to tear it out and try again, but I wanted to comment here first to see if anyone else is having the same problem. Oh…and I don’t even have a girl. I have two boys. But I had to make these anyway because they are JUST TOO CUTE!!! Alright,I definitely made a mistake. Step one should be ch 13, work 3 sc in 2nd ch from hook. The rest should be right. These are wonderful! I have 1 question: what is the difference between Sctog 1 and Sc2tog? I can’t figure it out. Hm. I think I may have made a typo. About where in the pattern is that? I am not sure, but I might have meant sc2tog 1 time, and missed typing the 2 in the word. I’m sorry for any trouble. Please email me, so I can help you get this worked out! whistleandivy at gmail dot com. These are so precious! I love the colors too. Very nice pattern Came out very nice. Can we sell what we make . Congrats on being featured on What’d You Do This Weekend hop. I’m a copy cat. I HAVE to include this post on my hop this week, too. It is called Wonderful Wednesday. Please stop by. Thanks Lynn :) And thanks for your prayers. Every one counts! These are just perfect! So many people have family members and friends affected by this horrible disease…myself included. My little brother was diagnosed with brain cancer when he was 5, he is now 27! I will be praying for little Brylee and her family and wish them the best! I am so glad to hear that about your brother. Thanks so much for your kind words and prayers. Miracles can happen! Thanks for linking to Take-A-Look Tuesday over at http://www.SugarBeeCrafts.com – you were featured yesterday! 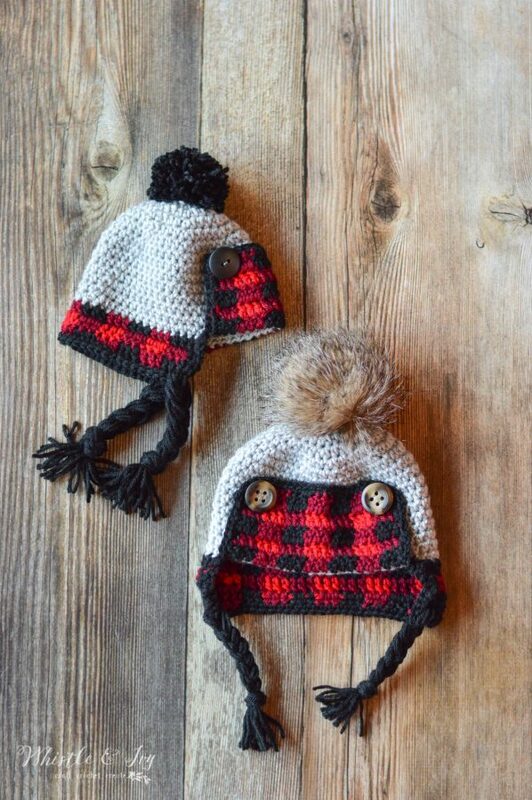 Wish I knew how to crochet, these are darling! Donated and will download pattern for later use! Thinking of little Brylee and her family. Ask some of your friends or at church and maybe you can find someone to show you. I just volunteered to teach crochet or knitting one evening at church. I had to review as it has been a long time. I can usually teach people to do both . I make it simple. I bought an inexpensive beginning book to refresh my memory. Some of these patterns are so cute. Church is a great place to look as grandma age women may be able to teach you. Coming from the Sew Much Ado linky. Too bad I just had a little boy! The shoes are super sweet and so is your cause. oh, those things are so scary! Sending love and prayers! These are so sweet! Love! These little shoes are so adorable! I hope you’re able to raise lots of money for your friend’s little girl – I can’t begin to imagine what they must be going through! Those shoes are adorable! Thank you for the pattern. It is stories like this one that make us appreciate all that we have and hold those that we love just a little bit closer. Sending prayers their way. You are so welcome, I hope you enjoy this pattern! Thanks so much for the prayers, she needs them. You definately have a very crafty hand…the shoes are adorable. Yes, stories like this always make us hold our dear ones closer. So sad this has to happen to children especially. Thanks so much. Yes, this whole thing just breaks my heart. Very sweet Mary Janes…. kinda sad though cuz my DD will be 20 soon. Guess I have grandkids to make such lovely things for— once I learn to knit and crochet ! Thanks so much, Suz :) Happy Easter to you, too, have a great week! Downloaded and Donated!!! It’s great to see how everyone is doing their best to help out Brylee and her family. Sending prayers their way. How heartbreaking. That is so generous of you. They sure have a friend in you. Found you thru the Social hop. Am now following by Bloglovin. I hope you get a chance to visit my site. Those are so beautiful and sweet! My prayers are with your friends and their little girl. Absolutely precious! Sweetest things I have seen.